Today is Candlemas, also known as Ground Hog day. I wrote about this last year http://pixiedusthealing.blogspot.com/2011/02/groundhog-day.html and was quite surprised to discover all the tradition surrounding this day. It seems like cause for celebration no matter what you believe and that's always a good thing in my opinion. 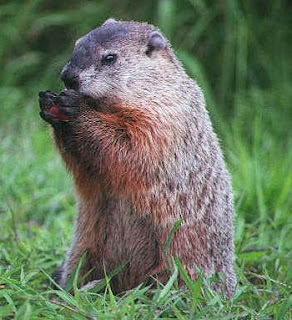 I think the Ground Hog is a pretty cool little guy though. I just wonder if we are really bugging him with all this media hype. I mean, let's face it, how many of us really look our best and are ready to face the cameras when we first roll out of bed after a good long hibernation? It's a good thing the Ground Hog is a pretty self-confident type creature with lots of trust in self. Steven Farmer in, Animal Spirit Guides, includes Ground Hog as a spirit animal. He writes that if a Ground Hog shows up it could mean you should "communicate your boundaries and limits clearly and straight-forwardly". Farmer also writes that it could mean you are going through an initiation of sorts. It could be a symbol that you are experiencing a cycle from which you could emerge with a new sense of self. So with so much global focus on the Ground Hog today, that seems to me to indicate we all could be going through a cycle of change from which the world may create new structures, identities and ways of being. That sounds like what is happening in the world these days, and what is predicted by many to occur this year of 2012. We are seeing old structures crumble a bit as new ideas and leaders take over. This also seems to me to be the type of energy that is manifested as we move from one season into another- especially considering the re-birth cycle of winter into spring. Maybe Ground Hog day, Candlemas, and all the energy around that is a celebration of cycles and rhythms. Something to remind us that from out of the darkness of winter and the rest and recuperation of hibernation, new form emerges. The ultimate "do over" for us all. Perhaps the point the Ground Hog makes, is that to some extent he gets to decide whether he is ready for an emergence, or whether he needs to rest and recoup a bit longer. He sets his own limits and boundaries, and personally, I'm not sure that it has as much to do with the weather as some people think! I'm pretty sure the "predictions" have been wrong a time or two. In my opinion, that self contained little guy comes out and peaks at the world, considers how he feels, and makes a calculation decision on how far ahead to set his alarm clock. At the very least he's back for another six weeks of sleep. Maybe he orders his seeds and goes back to bed? I take all this to mean that today is a good day to "check in with yourself". It seems like a good time to see how you are feeling and what issues you're making progress in and what things could use more work and perhaps help. It's a time to think about where you want to be in terms of self-development, goals, and strategies six weeks or so in the future. It's not about criticizing yourself if you're not where you think you should be. It's more about figuring out how much time you need to give yourself to build your strength and relax before you forge ahead. It's a time to consider whether or not you might need some help in order to achieve your future goals. That way, when you do have the strength and you do feel the warmth of the spring-time sun, you'll be ready to face it head on. Some people believe the Ground Hog gets scared by his shadow and runs away, back to his burrow. I don't believe that for a minute! I think he uses the opportunity to consider himself from a distance and think about his options. Maybe he experiments a bit between dreamland and reality and goes back to bed to allow his dreams the chance to mature into reality. Now that sounds like a good way to spend the time between winter and spring! Pleasant dreams.